With 1,100 watts of power in each channel (at 8 ohms), the XLS 5000 represents a new standard in power-to-performance at a price that won�t break the bank. Not only will the XLS 5000 give you plenty of volume, it will also deliver the cleanest audio possible thanks to its 21st century design. 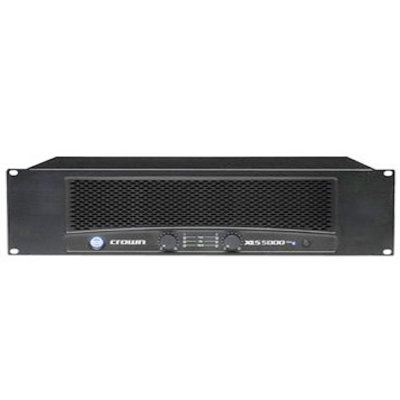 The Crown XLS 5000 isn�t just a pretty face - it�s built to last with a rugged, all-steel 3U rackmount chassis. There�s also an efficient, forced-air cooling system onboard to prevent excessive thermal buildup. Basically, you want to "set it and forget it" right? Well, Crown built the XLS 5000 with a pair of front panel, precision detented level controls, a power switch and four status LED which indicate power, clip and fault conditions. When you build the best products, you stand behind them with a great warranty, and the XLS 5000 comes with Crown�s three-year, no-fault, fully-transferable warranty. That�s confidence in a product design that also results in your confidence that the XLS 5000 will deliver year after year of trouble-free performance.